We’re going to try and put together a quick video tomorrow night highlighting images and video from Bike to School Day. However, we can only do this if you, our readers, create and share enough media. If you take pictures or video of your kids biking to school tomorrow, please send them to damien@streetsblog.org or tweet to @streetsblogla. We will credit each image or video in the credits. 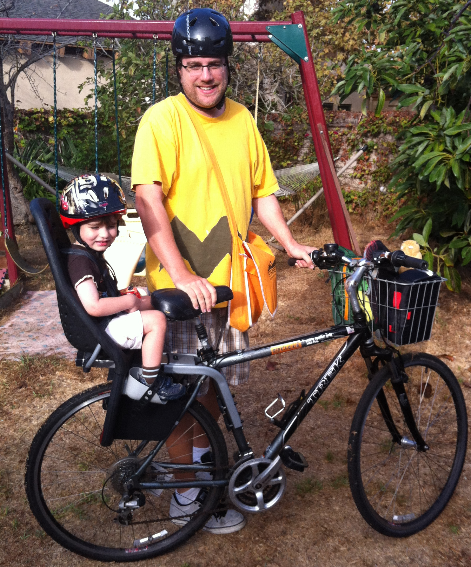 Bike to School Day will always have a special meaning in my family. The last Bike to School Day, October 3, 2012, I put Sammy in the back seat of Gunpowder and we rode together to his pre-school for the first time. I promised I would pick him up that afternoon, and he clapped his hands. Having ridden in a bucket bike previously, he had been on two wheels for all of his life after the first three months. It turned out I didn’t keep my promise. At the end of the school day, I was in the hospital with Marybeth while we waited for our second child to make her appearance. However, Sammy and I were back on the bike soon. Over Christmas break, I was struck with a rare viral pneumonia. Even after I was out, the doctor told me to limit my exercise, and not to bike, for another month. Then one February morning, after weeks of a dreary drive to preschool, Sammy was fussing. He didn’t want to go to school. He never wants to go to school. Have a happy and safe Bike to School Day tomorrow.